Your humble servant has rewrote Auctionator 1.0.0, made for TBC, to work on Vanilla. Hope you'll like it! I plan to add a "Buy" tab from the later versions of Auctionator sometime. Please comment if you found any bug and/or if you just want to react on this. Upd. : I've been asked to upload this 3 years old work to Github. will be included in the next "addon library" upload. This was one of my favorite add-ons. 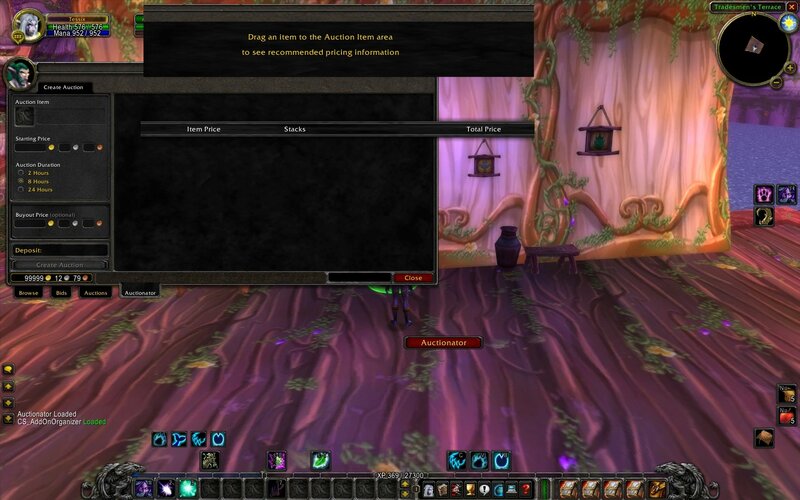 just checked this addon and found that "alt+click" moving items to auctionator doesnt work. I pretty love how active and loyal the community is to This project even though it's not released yet. Keep the good work going. checked this addon and found that "alt+click" moving items to auctionator doesnt work. Thanks for the note. It seems that the feature actually shouldn't have worked in original 1.0.0 version (as far as I recall I found no code peaces accountable for that), that's why I haven't reworked it. Maybe some day later. There is ingame option in 'Auctionator sttings' called like "use Alt+Click to move item to Auctionator slot". You still working on this? I was thinking of putting together another explained list of addons, just this time general addons that will include Auction addons. At the moment, Auctioneer is the go-to one to use. Auctionator was the go-to one in expansions mainly because the scanning of the auction house was near enough instantaneous...whilst with auctioneer...it take a couple of seconds per page to scan...adding up to a decent amount of wait time. If this mod is finished for vanilla/you plan on working on it, then I'll add yours to the list...since it is superior to its counterpart. You still working on this? Not really. I'm usually losing my interest when something is somehow done I think it's useful in its current state, you can put your items to the auction with auto lowest price set. I'm always using only this feature 90% of my auction time. Have no idea why, but disabling the cartographer addon solves the issue... I really wanted to use both =P Any ideas? Maybe I've just made a constant coordinates for all that interface stuff... If so - I believe it can only be solved by changing the resolution. Sorry about it. Hey Saturos02, I made a small fix to the Auctionator.lau so that it will play nicely with Cartographer. Notice that the only real changes are the if statements that help initialize the variables before they are used, very simple fix. Big thanks to nimeralos for porting this back to vanilla and mad props to waffo for fixing the errors. I too have the graphics all over the place like the screenshot above, any thoughts on how to fix that? I've been asked to upload this 3 years old work to Github. I would assume this is because absolute dimensions were used in Auctionator.xml file. I replaced all with RelDimension, and now it won't have a buggy UI, but the child elements (prices list, etc) are not visible anymore. I would assume the author could figure out which elements should have a Relative Frame.